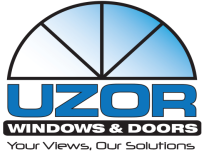 Options & Features - Uzor Windows & Doors Inc.
High Thermal Insulation Values of up to R-5 are achievable (depending on the glazing) Triple glaze, Low-E Argon, 1-1/2" IG U=0.20 reduces heating costs noticeably. High-quality replaceable gaskets, are standard in a neutral black and comprise the system of dual compression - seals that keeps the cold, draft and moisture outside. Galvanized Steel Reinforcing used according to our fabrication requirements, supports structural integrity 3 times that of aluminium. 5 Chamber Profile with a basic overall depth of 70mm (2-3/4"): is an ideal use of dead air's natural insulating characteristics.